When the sun is out to play, the hunt for fun is on. Having to all but hibernate in the winter makes us restless, so it should only follow that we’re out to make up for lost time in the warmer months. As summer officially approaches, we’re looking for as many shenanigans to partake in as possible. If you love sports where you get to shoot your opponent like paintball or laser tag, but don’t want to be weighed down in extra protection, then water balloons are an excellent choice for cooling off and having fun. Of course, our feeble human arms can only throw so far or well, so it makes sense that we would want a little help. 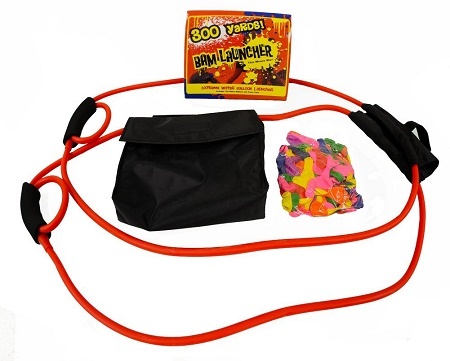 This Slingshot will help you launch up to 300 yards, but you will need to have two other teammates to accomplish a decent shot. It’s made of rubber and nylon, so it can withstand return fire and getting soaked. This comes with 150 balloons to get the party started, but you’ll need to make sure you fill them correctly to make the most of this experience. You should only fill your balloons to the size of a tennis ball, and leave them in a bucket of water (as most water balloons are made to be easier to break so you can’t hurt anyone). After you load it up, pull 3-4 feet back, let it fly, and hope your aim is sound. This is only going to cost you $24, and should be lots of fun for all involved. The Sound Torch – pyromaniac party time!